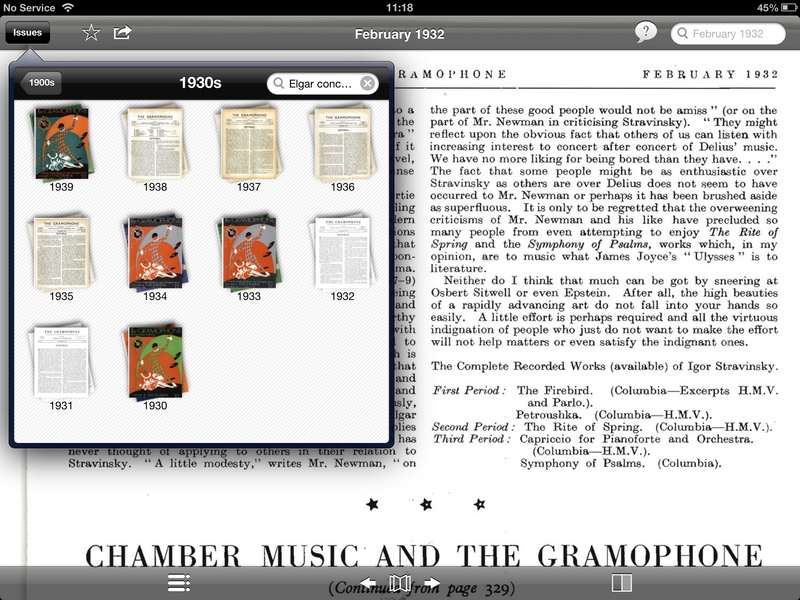 Exact Editions apps are all searchable. Individual issues can be searched; years, decades and all the available archive can be searched from within the magazine app. We have recently introduced a new search engine and an improved interface for browsing magazine archives and selecting the focus for a search. 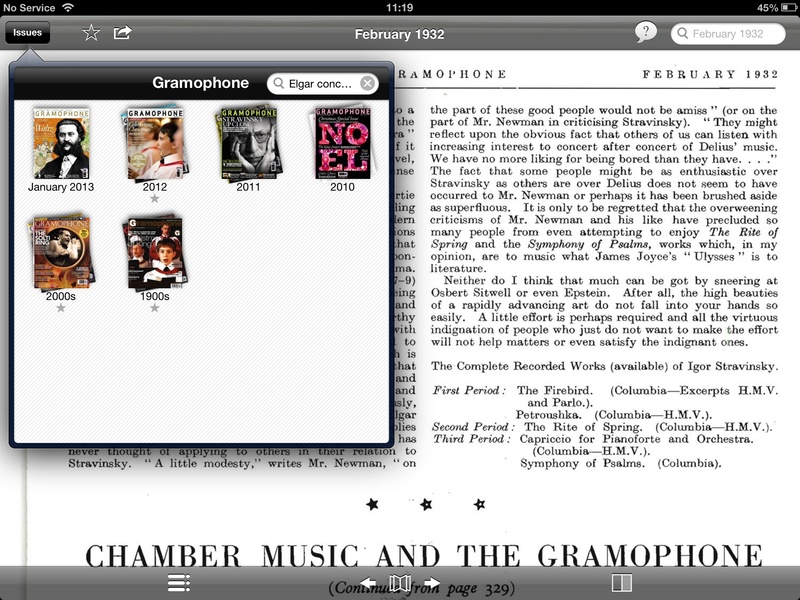 The Gramophone app now has access to all the issues published since the 1920’s (over 1,000), so it may be necessary to focus the search down on a particular decade or even year. This is done by clicking on the stack of issues that you deem to be the target of your search — in this case it might be the 2,000s or the whole of the 20th century, or dropping back to the 1930’s. Notice that if we decide that we want to make our search broader than the 1930’s we can switch to searching the whole of the 20th Century by clicking on the “1900s” at the top left of the search pane. The user can click top left to zoom-out the search function, or select a stack of magazines, a decade, or a year, to shrink back to a tighter focus. Search results pop up in the search window with thumbnails of the page view, so that a rapid judgement can be made on the value of a hit. When the user jumps to the page, the search terms will be highlighted on the page (in effect on the JPEG) as the database keeps track of co-ordinates of every word. The search syntax is similar to Google’s for web search, so you could search for “Kate -Moss” if for some unfathomable reasons you didn’t want to see Kate herself. 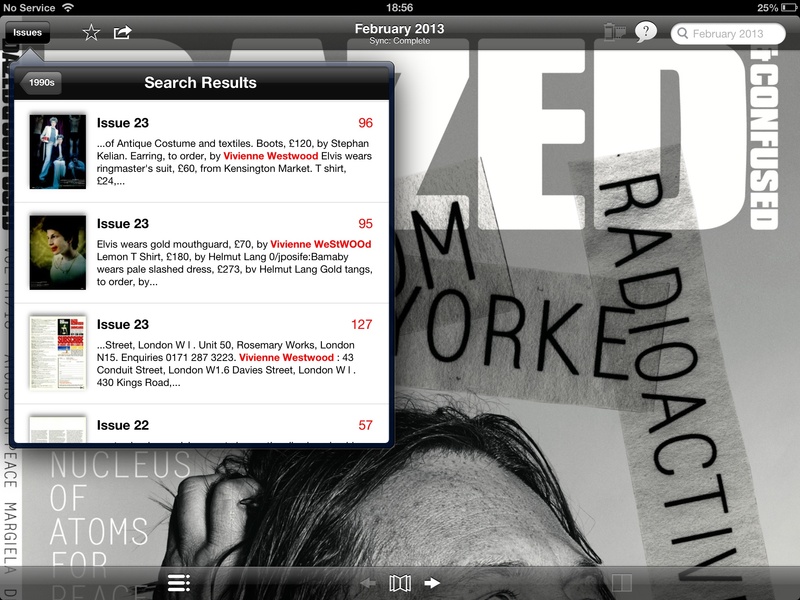 Why is searching a magazine that you have in your app so cool? One reason its very attractive is that magazine archives can be extremely rich and fascinating for current readers. If you like Dazed & Confused enough to subscribe to it, you are almost certain to enjoy browsing its vivid and rich back issues; if you are keen enough on classical music to buy Gramophone every month, you will probably be fascinated by historic reviews of Britten and Karajan. But there is a stronger and a deeper reason: digital magazines with easily accessible archives are giving us something that really can not be had from a pile of print copies: ‘end to end browseability’ and ‘lean back access to the whole thing’. The Exact Editions magazine platform sometimes gets classed as a ‘page turner’, a description which is sometimes intended to be derogatory. And as it happens, many of the ‘page turning’ solutions are unreliable and poorly implemented, but the fact is very few so called ‘page turning’ solutions and none of the ‘reflowable’ models for digital magazines have an effective way of handling archives or searching back issues. The next time someone calls us a ‘page turning’ solution I will counter with ‘issue searching not page turning’. And, in any event, on the iPad we are more interested in page sliding and page pinching, than in the curl of the corner.